What Is a Bamboo Wife? How Is the Bamboo Wife Used? Do People Still Use the Bamboo Wife Today? Where Can You Buy a Bamboo Wife? Bamboo Wife Alternatives: What Can Be Used Instead? Having trouble looking for information on the bamboo wife? You might be missing out on a few leads. As this bolster is most common in parts of East and Southeast Asia, there are several non-English terms for it you may not know. In Japan it’s chikufujin, while in China it’s zhúfūrén (竹夫人). In Korea it’s jukbuin (죽부인). Worth noting that these three names literally mean “bamboo wife” in the respective local vernaculars. In the Philippines, it’s known as kawil; also the Tagalog word for a fish hook or a chain link. This is perhaps because the bolster can be kept hanging from a wall hook. English speakers also use the term Dutch wife, but this has various unrelated definitions. The origin of the alternative term is thought to be either from the time of the Dutch colonization of Indonesia, or an appropriation of the old usage of “Dutch” to mean that something was irregular. The latter is exemplified in other terms that survive to this day. For example: Dutch courage, which is confidence gained from drinking alcohol. The origin of that usage, in turn, stems from the Anglo-Dutch wars of the 17th century. A bamboo wife is a long, hollow and handwoven bolster that is often comparable to the human body in size. True to its name, it’s almost always made out of thinly cut bamboo strands. If not, it’s usually another material that’s easy to weave, like rattan. There are several bamboo wife variants, ranging in length and circumference. Why? Sleepers come in all sizes! It is supposed to be roughly the same size as the person using it, so children and adults will have different needs. There are also types of bamboo wives that are shaped differently, to allow changes in sleeping position or other uses. For example: A properly designed bamboo wife can serve its main purpose, but may also serve as a stable support structure for feet that need to be propped up. Typically it is embraced in a side sleeping position. The open wooden structure helps regulate body temperature and eases usual aches and pains from side sleeping without a bolster. In East Asia and Southeast Asia, summers are often hot and humid! This makes sleeping with fabric pillows or bedding more than a little uncomfortable. Without proper ventilation or temperature control, heat and moisture can build up. The bamboo wife solves this problem by allowing airflow to reach more parts of the body. At first glance, a bamboo wife may look like a basket or an ornamental piece, but it is a very useful bedtime companion. Though inflexible and hard, its dimensions are close to the more familiar orthopedic body pillow or bolster. Sometimes, its shape is even designed to inspire an intuitive response! Notice the curves on the bamboo wife in the image below. The slimmer parts make it easier to wrap arms and even legs around the bolster. Yes, but the tradition of the bamboo wife is kept alive these days primarily in Korea. The jukbuin is embedded deep into the country’s culture, with mentions of the term in local literature dating back to the 13th century. There is also an annual event that keeps the jukbuin in the news year after year. Held at Damyang County (Damyang-gun) in the South Jeolla Province (Jeollanam-do) of South Korea, the Damyang Bamboo Festival is held every spring. 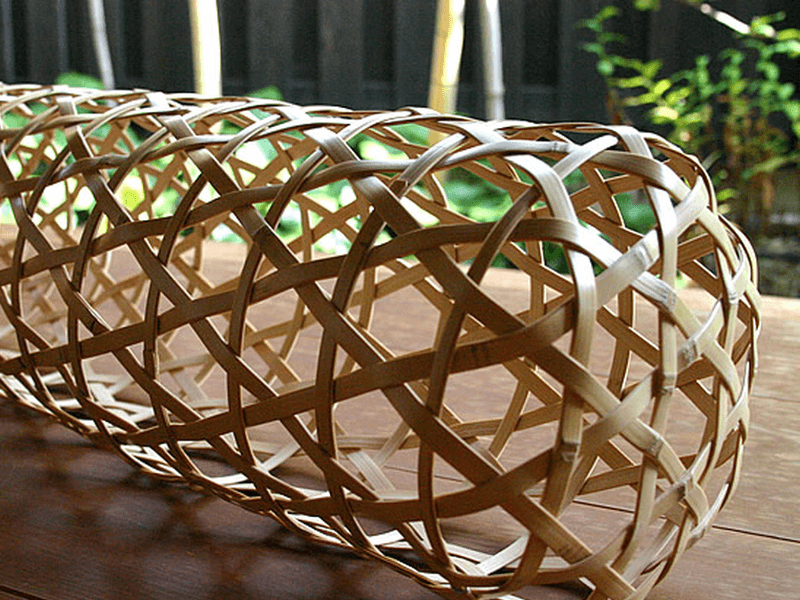 It showcases local products made out of bamboo, including a large array of jukbuin. Bad craftsmanship. Always check for signs of good craftsmanship! A poorly made bamboo wife can result in wood splinters lodged into your skin. Indoor cooling technology. Who needs a wooden frame to hold in bed during hot summer nights, when you can simply control the temperature of your bedroom? Electric fans and air conditioning are easier to use than a bamboo wife. In most cases, they’re easier to find, too. Modern bolster alternatives. Because bedrooms are now cooler due to modern technology, it follows that modern alternatives to the bamboo wife would be more popular. Body pillows in particular accomplish the same goal. Another great example is Japan’s dakimakura, which has become well-known worldwide in the past decade. What’s the takeaway here? While the bamboo wife is no longer present in most East Asian and Southeast Asian homes, the idea of a bolster for hugging while you sleep has endured. It may have even spread to more parts of the world. Unfortunately, there is no easy way to purchase an authentic bamboo wife if you don’t live in a country that traditionally uses them. Try searching for a way to buy a bamboo wife online, and you’ll see what we mean. Yes, there are online stores that carry them. Here’s the thing: Most bamboo wife product pages we’ve seen are either in the local language of the manufacturer or only offer local shipping. The rare exceptions typically offer the bamboo wife at an exorbitant price. The bamboo wife isn’t something you can find at any corner store in Korea or Japan, either—much less the Philippines. Should you plan on looking for one while on a trip, don’t expect it to be stocked at tourist shops or night markets. Your best bet might be to plan a vacation and go to the Damyang Bamboo Festival. If you want to use a bamboo wife, you are probably looking for three things: uniqueness, comfort and support. Body pillows can offer these, and are easy to find in department stores and online retailers. It’s very likely that you can walk into your local Kohl’s, Target or Walmart and expect body pillows to be stocked and available. You may discover, though, that most offerings are just simple straight bolsters. Looking for a Straight Body Pillow? Want to purchase a long bolster online? Below are some of our favorites. The Aller-Ease Cotton Body Pillow ($17.99 on Amazon) is very affordable. It features a 100% cotton cover and hypoallergenic fill made of polyester. It’s machine washable, too. You can also machine wash and dry this pillow—can withstand a lot of mess and easy to maintain. The Zituop Full Body Pillow ($59.99 on Amazon) comes vacuum sealed and in dakimakura sizes, so you can get either the 150 cm or 160 cm long variant. It also features a cover with a zipper, should you want to add to or replace the provided high quality cotton filling. The Snuggle-Pedic Shredded Memory Foam Body Pillow ($69.99 on Amazon) comes with a money back guarantee and a 20-year warranty. It features CertiPUR-US approved foam filling; and a breathable cover made of a lycra, polyester, and viscose bamboo fiber blend. This pillow is also machine washable. Looking for More Complex Body Pillow Designs? Did the bamboo wife hold your interest because it was unique-looking? Want an alternative that’s similarly distinctive? You can check the nearest baby store. Yes, even if you’re not expecting! A sizable establishment might have a section for pregnancy or maternity bolsters. You may find large and unusually proportioned body pillow-like products there. Of course, you can always look online. You’ll find a huge variety of these oddly-shaped body pillows! Below are two of our favorites. The Leachco Snoogle Pregnancy/Maternity Total Body Pillow ($59.99 on Amazon) is a C-shaped body pillow. 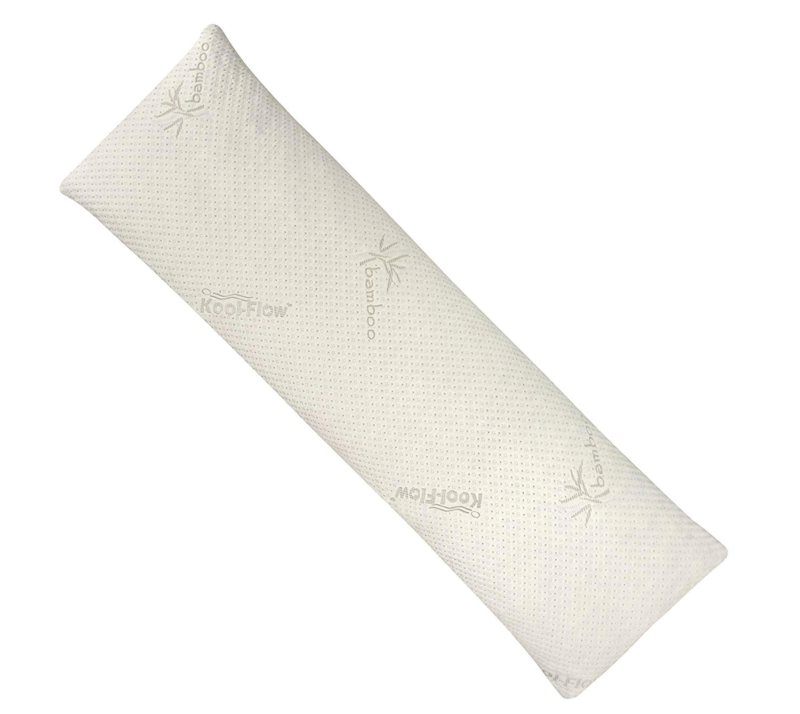 It comes in six colors and features a machine washable, removable sham-style cover made of a polyester and cotton blend. Note that cover is machine washable, but the pillow is spot cleaning only. The Moonlight Slumber Comfort-U Total Body Support Pillow ($99.95 on Amazon) is a U-shaped body pillow. It comes with a thin, zip removable cover and is filled with hypoallergenic synthetic down. The entire product is machine wash and dry compatible for easy maintenance.